Offering you a complete choice of products which include tensile fabric structures, hyper model tensile roof and drop awnings. Our organization is instrumental in offering superior quality Tensile Fabric Structures. These products are manufactured using optimum grade raw material, which are procured from the most leading vendor of the market. Products we offer are manufactured under proper supervision and guidance of skilled and experienced experts to get premium quality output. We are among the well-known supplier of excellent quality range of Drop Awnings. The offered Drop Awnings are used to cover the open spaces of shop fronts, restaurants and farm houses. Our provided Drop Awnings are manufactured using high grade basic material and the latest technology in line with industry norms. 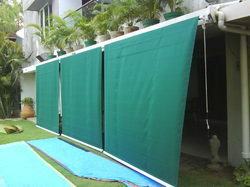 Moreover, these awnings are tested against various quality parameters in order to ensure their quality.